Each day, an estimated 2.5 quintillion bytes of information are generated. By 2020, market research indicates this could rise to a staggering 40 zettabytes on a daily basis. The generation of Big Data has far exceeded the capability to store, process, analyze, and disseminate it, putting stress on IT infrastructures and potentially limiting our ability to harness its power. The availability of computing on demand with cloud technologies, however, has enabled us to access computer power and information resources worldwide, at relatively low cost and with limited IT support. Many pharma companies have been migrating from in-house computing infrastructures to cloud computing to help address processing and storage issues. Bioinformatics is the application of computers and IT, mathematics, and engineering in the management and interpretation of biological information. The global market comprises three segments: bioinformatics tools and database services; data analysis software and analytical services; and IT infrastructure and services. BCC Research reveals in a new analysis that high-throughput processes (such as next-generation sequencing [NGS]) have spurred users to adopt cloud computing solutions to manage the big data sets generated by these technologies. According to BCC’s study, the global bioinformatics market should total approximately $8 billion by 2019, reflecting a five-year compound annual growth rate (CAGR) of 14.2%. Data analysis software and analytical services, the second largest and fastest-growing of the three segments, should reach $3.1 billion by 2019, reflecting a five-year CAGR of 16%. This sector will be driven by the development of cloud-based end-to-end solutions to assist in the accurate and rapid analysis of sophisticated and comprehensive data sets. This would allow data on low-frequency genomic variants, protein interactions, and RNA sequencing to be assessed in isolation and in combination, to more effectively diagnose and treat diseases using precision medicine. Large IT companies such as Google, Apple, and Amazon have moved into the bioinformatics space and have begun to address data security issues. The IT infrastructure and services segment is forecast to reach $1.2 billion by 2019, with a CAGR of 15.3% from 2014 to 2019. The bioinformatics tools and database services segment of the market is forecast to grow to $3.6 billion by 2019, with a CAGR of 12.4% from 2014 to 2019. Other drivers of the global bioinformatics market include precision medicine and the identification of biomarkers; cloud-based solutions that help with the storage and retrieval of big data sets; and a shift toward value-based care, with increasing use of mobile health technologies and social media. Vast amounts of information that is being captured by wireless, data-driven devices in the real-world setting can be used to modify and optimize treatment regimens and tailor therapy for individual needs, which is the first step toward precision medicine. Market challenges include data integration, data reliability and standardization, and finding end-to-end workflow solutions that plug data gaps and improve compatibility between software platforms. 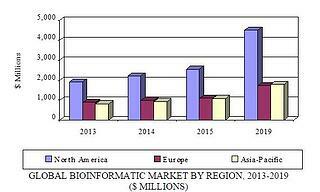 North America is the largest segment of the bioinformatics market, accounting for more than half of global sales (53.7%), followed by Europe and the Asia-Pacific region. Growth in developed markets will continue to be driven by private investment from the pharma, biotech, diagnostic, food, and agrochemicals industries, as well as by academic and government investment in leading organizations such as the National Institutes of Health (United States), European Molecular Biology Laboratory, and BGI (China). Meanwhile, the Asia-Pacific region will deliver a CAGR of 13.8% from 2014 to 2019, as the market expands to maximize opportunities in outsourcing of bioinformatics services and increased use of NGS technologies. The North America region should demonstrate a five-year CAGR of 15%, the highest rate among all regions. Over the next few years, genomics-based solutions will continue to drive the market, especially due to the cost effectiveness of NGS and uptake of the CRISPR gene-editing technology. Interest in using wider data sets that include proteomics and other types of data (e.g., imaging or clinical), and the development of cloud-based solutions that can disseminate data within and between organizations, will also be important drivers for future growth. 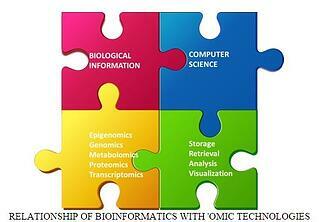 Bioinformatics: Technologies and Global Markets provides an overview based on geography, category, and application. Analyses of global market drivers, trends, and restraints, with data from 2013 and 2014, estimates for 2015, and projections of CAGRs through 2019, are provided. Technology, patenting trends, and the economic environment affecting the deployment of bioinformatics are examined. Other influential factors, such as R&D spending in the pharmaceutical sector, the growth of agrobiotechnology, and the expanded use of microbial genomics, are also discussed.